St. Mark's Evangelical Lutheran Church started with the dream of the Rev. William J. Ducker, Special Missionary of the Board of American Missions, the Rev. D.W.E. Pugh, President of the Florida Synod, and the Rev. C.F.H. Krueger, Chairman of the Missions Committee. The first meeting of the interested persons with these leaders was held at the J.H. Hinck home on July 6, 1938. The second meeting was held at the home of Dr. and Mrs. F.W. Krueger on July 13. Arrangements were made to hold the first service on July 17, 1938 in the Burns-Naugle Funeral Chapel. By November 13, 50 people were ready to organize a new Lutheran church on the southside of Jacksonville. ​On December 4, 1938, a Constitution was adopted. The congregation took possession of their first property (the South Jacksonville Presbyterian Church building) on February 1, 1939, at the corner of Hendricks Avenue and LaSalle Street. We think this is the present site of the San Marco Public library or at that intersection. Plans for a new building were developed and lots at 3976 Hendricks Avenue were purchased. In 1948, construction began. The new facilities were dedicated on February 13, 1949. At that time, there was a membership of 88 households with 197 people. ​Due to increasing attendance, two worship services were started in September 1951. An expansion program became imperative, requiring additional property. 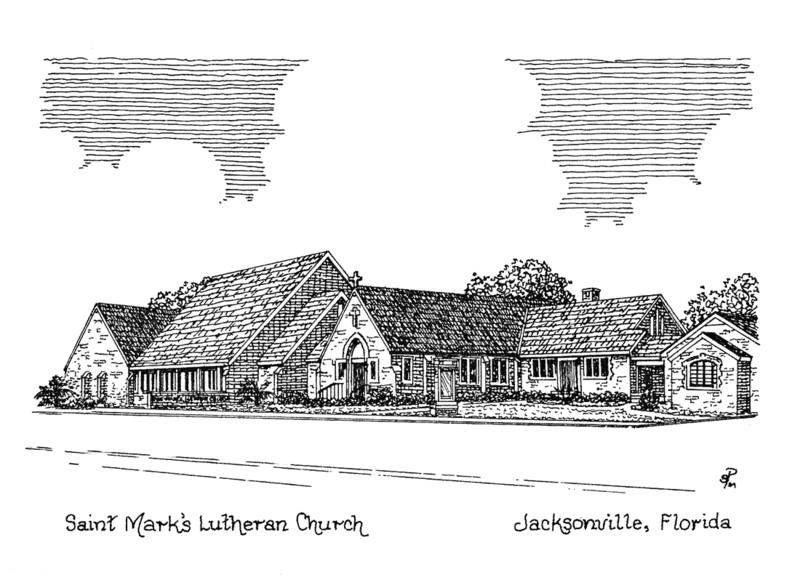 A master plot plan for adding a Fellowship Hall, Education Building and Nave was developed. The education building program became first priority, and dedication of the new facility was held July 24, 1955. Several years later, it was name "The Nordsiek Wing." Renovations to provide more adequate educational administrative facilities took place in 1972-1973. During this period, faceted glass windows were added to the Chapel. The Vicar program was initiated in 1975. The decade concluded with a parish commitment of nearly $25,000 for the LCA Strength for Mission Appeal. In 1984 over 600 people attended the dedication of the new worship and renovated fellowship space. Assistant Pastor Kathy Baines and Cantor Jim Rindelaub joined the staff in 1985. The 50th anniversary observance in 1988 included a love offering of $50,000 for community ministry through Lutheran Social Services. Vision 21, a strategic plan for the 1990s was completed in 1989. St. Mark's Ark Child Development Center opened in 1990. A major capital funds campaign, "A Gift for God's Children," took place in 1994. At the 1995 Synod Assembly, Pastor William Trexler was elected Bishop of the Florida-Bahamas Synod for a six-year term. Bishop Trexler took office August 1, 1995. Trexler then called Pastor Baines to serve as one of his assistants. On October 1, 1995 she began her new call as Assistant to the Bishop. Associate in Ministry Carol Schickel was called to serve during the interim. In May 1996, the Rev. Dr. William F. Scholl accepted a call to serve St. Mark’s as Senior Pastor. During his tenure, the church facilities were expanded to include a new fellowship hall, music suite, kitchen, and offices for the church staff. In July 1998, the Rev. Laura M. Wind accepted a call as Associate Pastor. In October 2000, Nancy Smith accepted the position of Director of Sacred Arts, Music, and Liturgy. In 2002, Pastor Wind accepted a call to Epiphany Lutheran Church in Winston-Salem, N.C. After consideration of St. Mark’s needs, and the growing number of young families and youth, the congregation decided to call a rostered Associate in Ministry (AIM) who would work primarily with children, youth, and families. In 2002, Shelley Wiskirchen was called to the position of Director-Youth and Family Ministries. A highlight of 2003 was the purchase of a house on London Road immediately adjoining the church property for future use as an education/retreat center. ​On October 31, 2004, after more than 8 years of faithful service to St. Mark’s, and more than 30 years in the ordained ministry, Pastor Scholl retired. In January 2005, Shelley Wiskirchen accepted a call as Admissions Associate at Southern Lutheran Seminary. In November 2005, Nancy Smith and her family moved to Atlanta, Ga.
​During a time of great change, St. Mark’s was blessed to have Pastor Don Reiter serve as interim pastor. Many members of St. Mark’s gave of themselves to keep ministries and programs running smoothly. In August 2006, the Rev. Richard W. Dow accepted a call to serve as Senior Pastor. In November 2006, Tony Cruz accepted the position of Director of Music Ministries. In July 2008, Alan W. Peacock was ordained and installed as Associate Pastor at St. Mark's. The Rev. Alan Peacock resigned July 2010. The Rev. Richard Dow resigned September 2010. The Rev. Thomas S. Hanson began serving as interim pastor on October 1, 2010. Hanson had served as an intentional interim pastor in six congregations, five in Minnesota and one in Florida before coming to St. Mark's. On October 2, 2011, the congregation called him as senior pastor. He was installed on November 20, 2011. In August of 2011, we restarted Vacation Bible School with almost 120 childen and 65 volunteers. Since then, VBS has become a favorite part of our outreach and education ministries with 70 to 85 children and more than 60 adults participating each year. We completed a major upgrade of our pipe organ in 2013 with the addition of 22+ digital ranks. Bach Vespers has again become an important part of our continuing music ministry together with our sponsorship of the San Marco Chamber Music Society that performs five times each year in our nave. Our outreach is expanding beyond mercy ministries into justice ministries with our involvement with ICARE, a local association of Christians, Unitarians, Jews, and Muslims working for justice in our community. We contributed almost $7,000 to the ELCA Malaria Appeal and a large sum to Heiffer Project during Lent 2014. In August 2014, seven of our members went to Haiti on a mission trip. All say it was a very meaningful and important experience for them. We have also made our building more accessible with ramps at the north door of Fellowship Hall and another into Luther Hall. Automatic door-openers were also installed on the entrance to Luther Hall. The Rev. Thomas S. Hanson resigned Late 2015.